Dreams are sometimes hard to forget. Have you ever had a dream that felt so real you remembered it all through the next day? I have. I want to tell you about a real man who had four dreams that changed the course of his life. Long ago there lived a man named Joseph. He was engaged to a woman named Mary. The Holy Spirit came unto her and she conceived and was going to have a baby. Joseph didn’t know what to do with Mary because he didn’t understand God’s plan. He woke up and immediately made arrangements for a wedding. He was faithful. Mary and Joseph became husband and wife. He didn’t understand it completely but he obeyed right then. A few months later, the government gave orders to all the people to go to their place of birth to be counted. The counting is called a census. Bethlehem is the place where his ancestors came from. He traced his family back to king David who was born in Bethlehem. Mary also traced her family back to king David, through a different branch of the family tree. Joseph was a carpenter, meaning, he built things with his hands. He may have taken a few tools with him as he saddled a donkey. He loaded clothes, food, and water on the donkey’s back. When the time came to go to Bethlehem, he helped Mary onto the donkey. Mary was pregnant and the trip would be long. She may have walked some of the time and rode on the donkey the rest. Either way Mary would have been uncomfortable. The trek was slow and took many days. Tired and weary from the trip, they came upon the sleepy village of Bethlehem. Inns dotted the little town which are like a Bed and Breakfast. Joseph inquired about a room. All the inns were full, not a bed to be found anywhere. Joseph was worried about Mary. Her time to give birth may happen any day. He needed someplace to take her to rest. At the last inn, he explained again their predicament. The inn keeper felt compassion for them and offered his stable where he kept his animals. At least they would be out of the wind and be reasonably protected and warm. Joseph probably cleaned out the stable and put in clean smelling straw making the most of the circumstances. Animals were their companions in the stable. Late into the night, Mary gave birth to the Son of God. What an amazing time to give birth in a stable. Out on the hillside nearby shepherds took care of their sheep. Suddenly, in the sky above their heads appeared an angel. 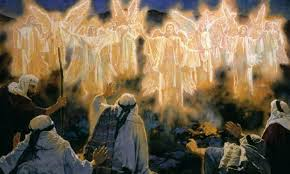 The angel said don’t be afraid and told them astonishing news. Read Luke 2: 8-14 for the complete details. The angel said a special baby came into this world tonight. He is the Savior, Christ the Lord. The shepherds needed to find the baby. Here are the clues to find Him: he would be in a stable, lying in a manger which is a dish for animals, and wrapped in strips of cloth called swaddling. The shepherds made hast to Bethlehem and found Mary, Joseph, and the babe. The proclamation the angel said rang true. Baby Jesus was wrapped in swaddling clothes and lying in a manger. The shepherds worshiped baby Jesus and left telling everyone they met what they had seen. Later, Joseph found them a house to live in. They were at home in Bethlehem one day when a knock sounded on the door. At the door stood men they had never seen before. They came from the East, called Magi. The Magi came in and worshiped Jesus. The Bible doesn’t say how many Magi there were. Tradition says three because of the number of gifts they brought: gold, frankincense, and myrrh. These were expensive precious gifts fit for a king. They had traveled far to bring these gifts because they saw God’s star and had followed it to Bethlehem. The Bible says these men had stopped off at king Herod’s house in Jerusalem before finding baby Jesus. The king asked them to come back and tell him where the baby is. That night, the Magi dreamed and were warned not to go see the king. The next morning, they left a different way back home. Joseph woke the next morning and did exactly what the angle of the Lord told him to do. 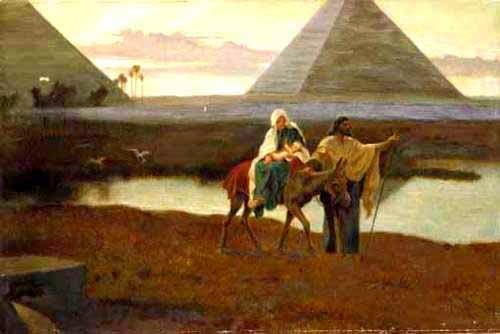 Mary, Joseph, and Jesus traveled to Egypt. Their stay in Egypt probably lasted just a few weeks. One night, Joseph had another dream. 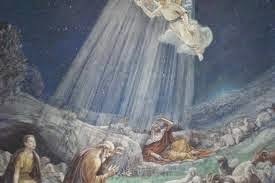 This time the angel of the Lord told him to go back to the land of Israel. Bethlehem and Jerusalem were in this region. What do you think he did? He obeyed. They packed up again and left for Israel. On the journey, Joseph had yet another dream. This time, the angel of the Lord said to go to a different place called Galilee. The city in Galilee they chose was called Nazareth. These four dreams of Joseph and the one the Magi had were for a special purpose. The purpose was to protect baby Jesus. Baby Jesus was God and man. He left His home in heaven to become a baby and live here on Earth. Satan, God’s enemy wanted to destroy Jesus. He tried to by making Joseph afraid of marrying Mary. God gave Joseph a dream to relieve his fear and told him what needed to happen. Joseph obeyed. Satan wanted to use Herod to destroy Jesus. Herod found out that Jesus was born and became angry and tried to have Him killed. God gave Joseph a dream to tell him what needed to happen. Joseph obeyed. Herod died and God gave Joseph a dream to tell him what needed to happen. Joseph obeyed. On the way there, God gave Joseph a dream to tell him what needed to happen. Joseph obeyed. We can learn many things from this. First is how God loves us. He loves us so much He sent His only Son to be born here on Earth. Jesus loves us enough to come and be a helpless baby, grow up, feel everything any human feels, understand pain and rejection, die a terrible death, and take all the sin of the whole world upon Himself. Obedience is another thing we can learn. What if Joseph hadn’t obeyed? We need to obey our parents and others in authority over us, right away. Joseph obeyed because he loved God, his wife, and her baby, Jesus. He took his role in Jesus’ life seriously. He showed love. 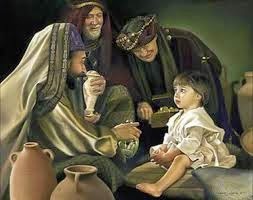 The Magi obeyed God too by not telling Herod where to find Jesus. They showed love and devotion to Jesus. The wise men believed He was the promised Savior. All this gives us a different view of the wonderful true Christmas story. I hope your Christmas is filled with love. Love is the most important thing in Christmas. Share love with others this Christmas. Matthew 1:20b-21 Joseph, son of David, do not be afraid to take to you Mary your wife, for that which is conceived in her is of the Holy Spirit. 21 And she will bring forth a Son, and you shall call His name Jesus for He will save His people from their sins.